I am currently giving a set of lectures as part of a module "Behavioural Economic: Concepts and Theories" in Stirling. I am posting brief informal summaries of some of these lectures on the blog to generate discussion. Today's lecture was on Rationality, Utility, Value and Decision-making. The lecture consisted of six sections (Fig. 1): (i) concepts of rationality; (ii) rational choice in conditions of certainty; (iii) rational choice in conditions in conditions of uncertainty; (iv) challenges to rational choice (v) loss aversion and the endowment effect; and (vi) implications of rationality assumptions and threats to their validity for policy. The main point of this lecture is to give a working definition of what we mean by rationality in Economics. This is a complex construct with many potential meanings across a wide range of literatures. In Economics we generally tend to mean that decision makers are consistent in their behaviour rather than to question their motivations. The basic microeconomic models of the consumer generally assume rational utility maximising behaviour. In the simplest case of choice under certainty, consumers are assumed to be able to represent all alternatives, rank them consistently and choose the bundle of goods they prefer the most subject to the constraints that they face. Rational consumers allocate their time to work and leisure and the subsequent income to savings and consumption so as to maximise their life-time utility. The implicit or explicit ability to perform the computations necessary to enact optimal behaviour underlie models of choice of consumer goods, labour supply and saving. In conditions of uncertainty, the models so far assume that people are able to represent accurately uncertain outcomes efficiently using available information and to choose consistently between alternatives with uncertain outcomes. If people behave in this fashion and markets are open, then we can view their behaviour as revealing their preferences and we can also predict how they will respond to changes in price and other constraints and the effects of these changes on their welfare. We will revise the basic models in the lecture. Rational decision makers should obey the axioms of (1) completeness i.e. they should consider all possible alternatives and have defined preferences for all alternatives (2) transitivity i.e they should be consistent in their preferences so that if A is preferred to B and B to C then A is preferred to C (3) Diminishing Marginal Utility and Diminishing Rate of Substitution i.e. as the person acquires more of a given good their marginal value of it becomes less relative to other goods (4) Non-Satiation i.e. people do not have so much of everything that they do not want any more (5) Reflexivity - a technical assumption which means that A is worth A. These conditions define people's preferences. If people hold these preferences, they will make choices that are rational provided they have the full information and there is no external obstacle to making their choices. People make these choices subject to the constraints that they face. The main constraints they face are the endowment of wealth and talent they bring into the world, the prices of goods, the wages that they can acquire from working and interest rates. Rational economic actors maximize their well-being (utility) by choosing how much to work at the given wage rate; choosing how much to save in different savings and investment vehicles and choosing the bundle of current consumption goods that they prefer they most from all the available alternatives. Under conditions of uncertainty, rational individuals must be able to attach accurate probabilities to all potential outcomes arising from different decisions. They then must attach value to each of these probabilistic outcomes. They must also attach a value to the risk itself, with different people being risk averse, risk neutral or risk loving. The mathematical model of how people attach value to probabilistic outcomes is known as a Von-Neumann Morgenstern utility function. It simply says that people multiply the subjective of an outcome by the probability that it will occur following an action (see Fig. 2 for an example). Rational individuals try to live their lives by maximising the subjective expected utility arising from all their behaviours. If people behave in this fashion, we can say that their behaviour is the best measure of their welfare - this is called "revealed preference" in economics. Similarly, we can derive the value of goods by looking at how rational people choose between them. The value of something is the rate at which rational people trade the item off against other items - in general in Economics, we choose money as a comparison good and express the value of goods in terms of currency. We also assume that economic agents care only for their own welfare and act to maximise their own individual utility. Technically, this is a separate assumption from rationality as one can be rational and altruistic or conversely irrational and greedy. In general, we will look at rationality and altruism separately. Furthermore, there is no real separation between the types of decisions that are of interest to economists and those that are not. When we use phrases such as consumption, saving, leisure, investment etc., we are referring to a very broad range of phenomena. Throughout the course, I will use examples from behavioural game theory rather than simple consumption examples as I think these illustrate the real-world importance of these issues. For now, you need to get a working definition of rationality something similar to the above into your mind so that you have a framework for what follows. We examined early challenges to the formal model of rational choice, in particular the Allais and Ellsberg paradoxes. The Allais paradox is relatively simple. In Figure 3, look at the gambles and decide which one you would choose. The "paradox" is that most people exhibit preference reversals in an expected utility sense in that they often choose 1A and 2B. If you look at the expected value of the gambles (see Fig.2, just multiply the value by the probability of receiving it) a person with consistent preferences would choose either 1A and 2A or 1B and 2B - after all the B gambles are essentially the same as the A gambles, we have just added an 80% chance of receiving 0 to both. In reality we often see preference reversals because many people have a preference for certainty and/or are motivated by regret aversion in the case of 1A. The Ellsberg paradox (Fig. 4) is from one of the most cited papers in behavioural economics and is a little more complex. Look at gambles 1 and 2 and decide which ones you would choose. We know 30 of the 90 balls are red (so a 1/3 chance of drawing red) and 60 are black or yellow, but we can't calculate probabilities for them because we don't know the distribution. It could be 1 black & 59 yellow, 30-30, 59 black & 1 yellow or any other combination. In economics terminology this is is a case of uncertainty (where probabilities are not known) rather than risk (where they are). All we can say for sure is that there's a 1/3 chance of drawing red and a 2/3 chance of not drawing red. Most people choose 1B here. Assuming a person is not just picking randomly, then if they pick 1B we may assume it's because they have deemed the probability of red appearing as greater than that of black appearing, i.e. they think p(black) < 0.33 since we know p(red) = 0.33. In other words we think there are 29 black balls or less. Gamble 2 is identical to gamble 1 except we now add the yellow balls for both A and B choices. Since we already preferred red to black last time, adding an equal amount of yellow balls to both sides shouldn't matter. If red > black, then red + yellow > black + yellow. The paradox here is that most people, having chosen 1B, now choose 2A. Why is that? Essentially it's because most people display ambiguity aversion. Black + yellow has known risks; there is a 2/3 (66%) chance of winning and a 1/3 chance of failure. Red + yellow is uncertain; the chances of winning could be 34.4% (if there's 1 yellow) or 98.8% (if there are 59). Your choice here will depend on how much variance you are willing to tolerate. In addition to these paradoxes, Rabin (2003) gives a thorough but accessible discussion of the main tenets of rational choice in economics and the potential problems with these assumptions. Much of the rest of the course will evaluate the evidence on how people make decisions and how this compares with the basic textbook model. It is worth pointing out at this stage that the rationality assumptions in Economics at first appear ridiculous. We know that people do not perform billions of explicit calculations each time they choose a product. However, it should be kept in mind that most accounts of rationality do not need to assume that they do. Instead, many economists believe that the markets contain sufficient cues to allow people to act rationally even if they cannot perform the computations explicitly or that sub-optimal behaviour will simply not survive in a competitive market. I might decide tomorrow to set up a business exporting sand to North Africa but I will quickly find out that this is not a sensible thing to do or else I will just go broke. When we are evaluating the rationality postulates it will be important to push them to their limits. The ultimate test will be whether groups of people systematically act inconsistently in important areas of their life in a persistent fashion. We will go through Rabin's account in the lecture and form an initial impression of the overall argument. The fifth part of the lecture introduced the ideas of loss aversion and the endowment effect. The basic idea of losses relative to a reference point being valued more than gains was developed by Kahneman and Tversky (1979) and has had a major influence on economics and related fields. See Fig. 3 to see the main insight of their Prospect Theory visually; note than a gain of 1 unit causes 1 extra utility, whereas a loss of 1 unit results in a disutility of almost 1.5. This is a simple example but gets at the idea that people asymmetrically value losses and gains. We examined experimental evidence on the endowment effect, in particular the famous mugs experiment of Kahneman et al, demonstrating that experimental subjects assigned to owning and selling mugs valued them more highly than those assigned to purchase them. To explain the experiment briefly, there were 3 groups: (1) buyers, who got some money and were asked how much they were willing to pay (WTP) for the mug, (2) sellers, who got a mug and were asked how much money they were willing to accept (WTA) to give it up and (3) choosers, who could choose the mug or say how much money they were willing to accept instead. The results (Fig. 6) are striking; the sellers demanded about twice as much to give up the mug as the buyers were willing to pay. 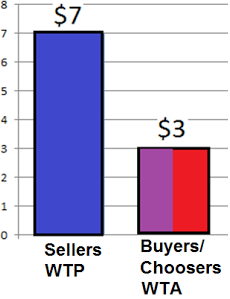 The choosers, who were not subject to the endowment effect because they were not in physical possession of the mug, were willing to pay about the same as the buyers. There is now a massive literature on the endowment effect and loss aversion that we will review later in the term. Beshears et al (2008) is an interesting and accessible account of why people's behaviour may not be fully rational in the sense used in the textbook. Beshears et al argue that many choices are characterized by conditions where the chooser does not have much experience, where third-party pressures are operant, where the chooser does not have much scope for trial-and-error and where starting points and consumer inertia dominate active choice. In such conditions, there may be a big gap between what people choose and what they would choose were they making fully informed and deliberative choices. This is an enormous challenge to basic economic theory and also potentially has major policy implications. 1. All mainstream microeconomics undergraduate textbooks (such as Varian) contain relevant sections on consumption, savings, investment, labour supply, choice under uncertainty and game theory. 2. 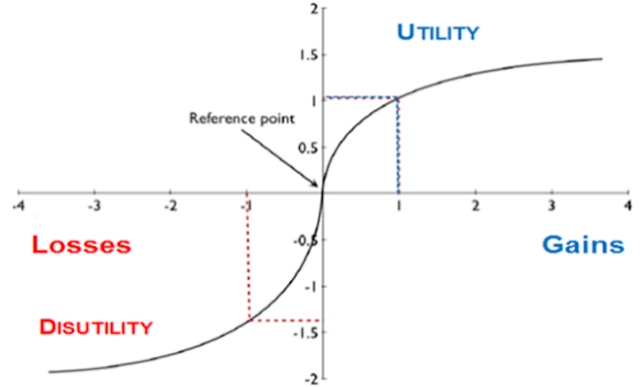 Chapter 3 of Wilkinson and Klaes "An Introduction to Behavioral Economics" contains a useful overview of the main concepts in utility theory.